Ingredients: brown rice pasta (whole grain brown rice, rice bran, water), filtered water, tapioca starch, non-GMO expeller pressed: canola and/or safflower oil, coconut oil, sea salt, vegan natural flavors, pea protein, potato protein, tricalcium phosphate, evaporated cane sugar, lactic acid (vegan), santhan gum, yeast extract, titanium dioxide (naturally occurring mineral), annato (color), onion, vitamin B12. Packaging promises: Certified Vegan by vegan.org, pareve (containing neither meat nor milk products) by The Union of Orthodox Jewish Congregations, Celiac Sprue Association gluten-free. I found this in the natural food section of some big grocery store somewhere in New York (I think). Regardless, I am a fan of Daiya. I like their vegan cheeses and the frozen pizza is pretty good, too. By”good,” again, I have to invoke Jack, who is my normal food eating “control group” of one. He seems to think these things taste okay — I haven’t had dairy cheese in over a decade, so what do I know about what’s palatable to people who eat real cheese? This, like the pizza, is convenience food. It’s priced accordingly, and it’s not homemade. But it’s ready in 10 minutes, in one pot! If this is safe for your allergens? Give it a try. This is rice pasta with a packet of cheez sauce. I gather that it’s closer to the Velveeta style mac and cheese than it is the Kraft blue box kind (my personal favorite of the quick mac and cheeses when I could eat those). The cheez sauce is thick and rather sticky, and if I make it again, I will do what one of my old roommates and I used to do and add broccoli. I think that would liven up the whole thing and make it a more complete meal. 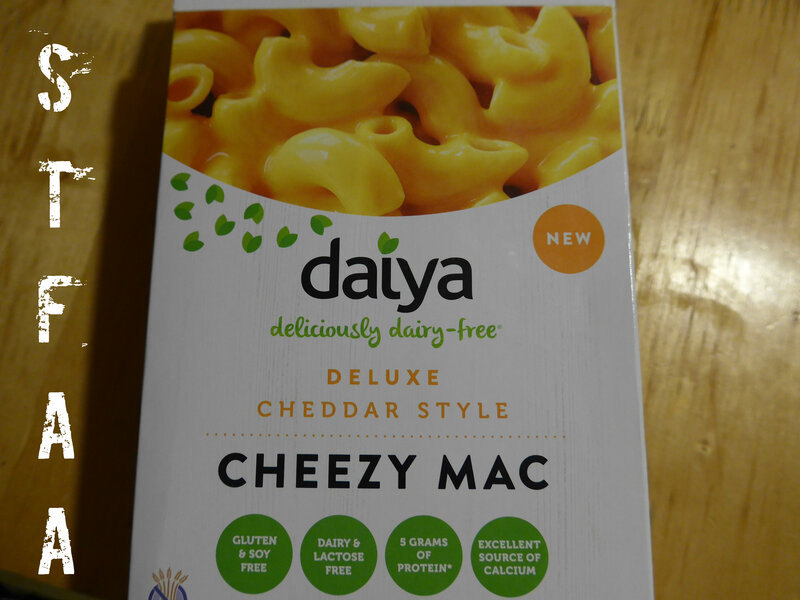 STFAA review conclusion: Daiya is reasonably allergy-friendly, and I like their products a lot. This mac and cheese is pretty good and worth keeping around for that night you really need dinner done in 10 minutes. Add some frozen vegetables for a better and more complete meal.